Egypt's President Abdel-Fattah El-Sisi met on Sunday a delegation of leading figures from Evangelical churches around the world as part of the Egyptian Evangelical Church's celebration of the start of the Evangelical Reformation 500 years ago. 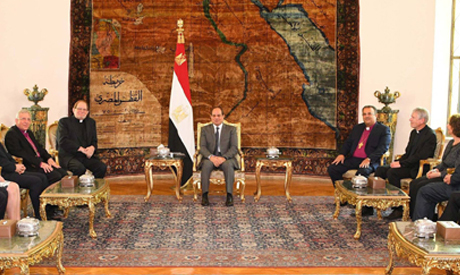 According to the Egyptian presidency, Sisi congratulated the Evangelical church representatives on the anniversary during the meeting in Cairo, expressing the country's appreciation for Evangelical Egyptians. Sisi also discussed with delegates the means to fight radicalism and terrorism. From their part, delegation members expressed their appreciation for the role of Egypt in "supporting stability and moderation in the Middle East," the Egyptian presidency added. The Egyptian Evangelical Church held its celebration Saturday in Cairo in an event at Al-Doubara Evangelical Church in Downtown Cairo. According to estimations, there are around 250,000 Evangelical Christians in Egypt. Overwhelmingly Coptic, Christians make up around 10-15 percent of Egypt's population of 104 million.